Idioms are always such a fun, yet tricky, concept to teach, especially to ELL students. 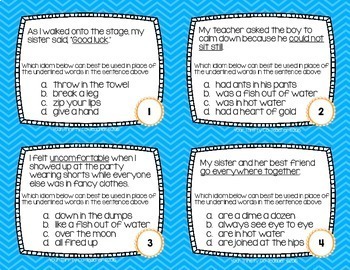 For this reason, I made these Idiom Task Cards. 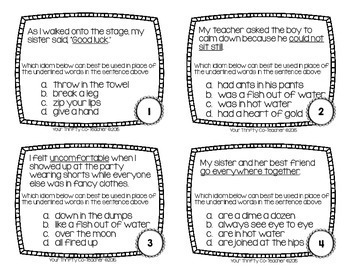 Unlike most other idiom task cards I found, these task cards have a sentence written with a fragment of the sentence underlined. The students choose one of four idiom options that bests fits the sentence. This 'reverse' activity will challenge students to really master and understand the meaning of the idioms. Use them for reinforcement by having students work on them during reading/language arts groups. Send sets of cards home as homework with students who need extra help. Use them as enrichment for fast finishers. Use as a whole group assignment, showing one at a time on the board and have students record their answers on the recording sheet or white boards. Give each student an answer sheet. Distribute the cards so that each student has one card on his or her desk (you may also spread them out around the classroom). Students answer the question on the card on their desk. After a set amount of time ask the students to “SCOOT.” All of the students move to the next desk where there is a new card. Continue until every student has answered every card, or until time has run out. Print out the cards on cardstock and laminate them for longevity. Cut them out and store them in a plastic storage zip bag or container. This product is now part of an IDIOM BUNDLE. Please take a look at it before purchasing this item to get it at a DISCOUNTED bundle price. 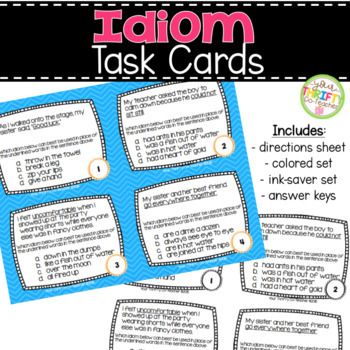 "I loved these idiom task cards. Organized and simple to use!" "My kids always love playing scoot games. They love the idioms and trying to figure out what they really mean."